Our TSRST 4.5 software fetures user definable temperature profiles and thermal cycling options. 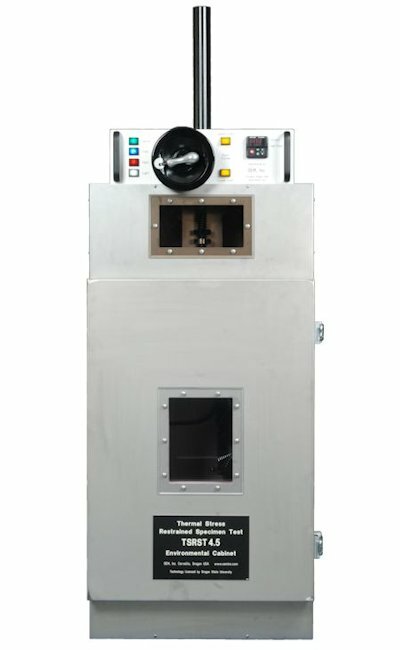 Thermal Stress Restrained Specimen Test (TSRST) simulates real-world thermal cracking conditions in your lab. Determine the failure characteristics of Asphaltic Concrete (AC) specimens when cooled below freezing according to a user defined temperature profile. Evaluate low temperature performance of field cores from existing roads. Test laboratory compacted cores of new or experimental mixes. Learn the effects on low temperature performance of modified binders and from adding modifiers to standard asphalt binders. Install your instrumented AC specimen inside the TSRST’s insulated Environmental Cabinet and cool it with Liquid Nitrogen (LN2) from a user-supplied tank or with chilled, dry air. Restrain the specimen with a computer controlled servo system that applies the force (stress) necessary to counteract the contraction that results from cooling the specimen. Monitor the test and record test parameters with the data acquisition system, which consists of transducers, signal conditioning electronics, a personal computer and OEM’s TSRST 4.5 software. Transducers include two displacement LVDTs, a Load Cell, four Specimen Resistance Temperature Devices (RTDs) and one Environmental Cabinet RTD. Choose a constant cooling rate, such as the 10°C per hour rate proposed in the original AASHTO Preliminary Specification TP10, or select a user defined temperature profile. The user defined temperature profile selects control based on cabinet or specimen temperature and may include multiple cooling cycles. Measure the load (stress) applied by the servo system to counteract the thermally induced specimen contraction, LVDTs confirm constant specimen length during the test; Specimen RTDs monitor specimen temperature and the Cabinet RTD monitor the environmental cabinet temperature. Using a personal computer running Wondows 7 Pro, control the test, log data in real time, create graphs and generate reports. Mount your round, square or rectangular specimen perpendicular to and centered on the platens using the OEM, Inc. Alignment Stand. Calibrate the LVDTs and Load Cell using OEM’s TSRST Calibration Device along with OEM’s TSRST 4.5 software. Oregon State University (OSU) and OEM, Inc. developed the servo controlled TSRST apparatus as part of a Strategic Highway Research Program. OEM, Inc. is the only firm licensed by OSU to manufacture the apparatus. OEM’s TSRST meets the requirements set forth in the original AASHTO Preliminary Specification TP10-1993. Check out our OEM-Cooper Asphalt Pavement Thermal Test System.